If you would like to customise any of your crush accessories please get in touch. Perhaps you’d like Lexi in another print? Perhaps you like style but would like it longer? Perhaps you’d like a two tone Skinny or Lexi, with your two favourite colour ways. Or a neutral colour on one side and a print on the other? Id love to chat about what you’d like so please do get in touch. You can also add your print choices to the notes on your order if its just the fabric that you’d like changed. If you’d like to customise your collar with swing tags you can do this on site in 2 ways. * By changing the colour of the cord ties. You can choose to do both or just one. 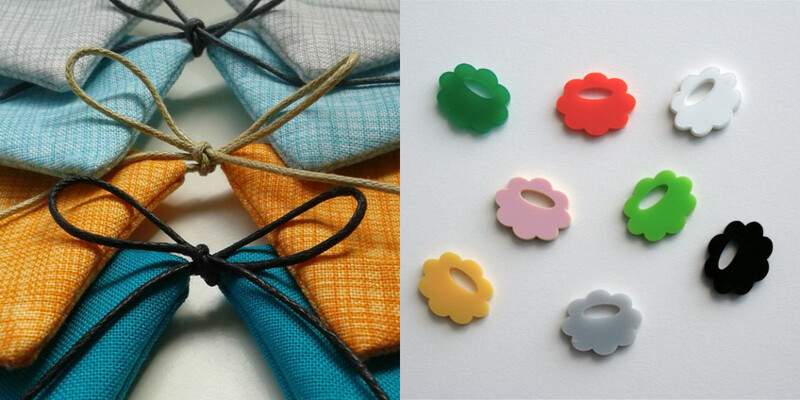 The swing tags are little cloud shaped perspex tags that come attached to the ends of the collars ties adding the perfect pop of colour or contrast. They look so good and do actually ‘swing’! 3. We will do the rest for you and your collar will arrive customised with your chosen tags. Black. White. Cream. Camel. Light pink. Dark pink. Faded red. Light green. Dark green. Denim Blue.Turquoise. Just leave a note with your colour choice in the special instructions box on checking out and your collar with your choice of coloured cord ties will be custom made for you. There is no extra charge for changing the colour of the cord ties. Note : As the customised collars are made to order they take a little longer than off the shelf. All custom orders aim to be posted to you within a week of receiving the order and you will be notified email when its on its way.